This soothing back, neck & shoulder massage will relieve stress and leave you feeling deeply relaxed. Focusing primarily on the back, shoulders and neck area, this deep back massage will help to relieve tension and stiff aching muscles. An invigorating, deep high pressure water treatment applied with specific sequences over your body to stimulate the lymphatic system, alleviate tension in the muscles and reduce the appearance of cellulite. This personalised express treatment includes a facial cleanse, massage and mask with products selected by your therapist to suit your skin, leaving it glowing and refreshed. Refresh and brighten your eyes with this revitalising eye treatment, the perfect addition to any facial. 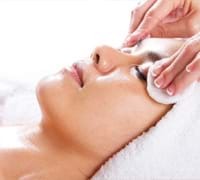 This treatment uses specialised massage techniques to improve micro-circulation and drainage, helping reduce puffiness around the eyes whilst rose wax and shea butter nourish the skin and help it stay hydrated and soft.